After surveying the story of Ehud, my Bible college professor said, “Perhaps you could call this story ‘When Lefty Let Fatty Have It.” Twenty six years later, I still remember his strong West Virginia accent, his perfect delivery, and the smile he had on his face because the students got the punch line. Sin: Israel “forgot the LORD the God and served the Baals and the Asherahs” (3:7). Supplication: Cushan’s control of the Israelites lasted 8 years until the Israelites cried out to the LORD (3:9). Salvation: The LORD raised up Othniel to deliver the Israelites from the control of Cushan (3:9-10). Silence: The Israelites had peace for 40 years until the death of Othniel (3:11). Eid al-Adha, sometimes called the Festival of Sacrifice is an important festival for Muslims around the world. It occurs in connection with the yearly pilgrimage to Mecca, serving as the conclusion to the (at least once in a lifetime) required journey for all Muslims. The point of the festival is to remember and commemorate the trials and triumphs of the Prophet Abraham. Some suggest that Eid al-Adha is the most important festival in Islam because God’s command to Abraham to sacrifice his son, who was ultimately replaced by a ram, was Abraham’s greatest trial and triumph. Abraham obediently took his son, placing him on the altar (Qur’an: on his forehead) and as he raised the knife, the angel directed him to replace his son with a ram that was nearby. Whether the Festival of Sacrifice is the most important or not, the symbolism demonstrated in the festival activities is quite powerful. For me, the most memorable activity of the festival is the sacrificing of animals: camels, goats or sheep. And this might be the most memorable for many. In fact, for some 1400 people in Turkey in 2006, the sacrifice will be the most memorable part because they all ended up in the hospital emergency room as a result of wounding themselves in the process. Sometime last year (2006) while preparing for a lecture on Islam that I was to give, I was reading the Qur’an and stumbled upon a very interesting (to me) discovery. I was reading Surah 37, as-Saffat, when I came upon the detailed story of Abraham sacrificing his son, which was mixed in with stories of several prophets. Eight to be exact. The names of those prophets named in Surah as-Saffat are: Noah, Abraham, Isaac, Moses, Aaron, Elias, Lot, and Jonah. You will see that Ishmael’s name is missing. Why is this important? Because Muslims, during the Festival of Sacrifice, are commemorating the near sacrifice of Abraham’s son Ishmael, not Isaac as the Bible teaches. When I discovered the absence of Ishmael’s name, it was one of those explosive moments when one thinks, “I can’t be reading this right.” That being the case, I re-read the passage and Ishmael’s name was still absent. Then, I got a pencil and re-read the chapter, writing down the list of people named in as-Saffat. And, my first reading was still correct: Ishmael isn’t named. In fact, he isn’t named as (almost) being sacrificed anywhere in the Qur’an. Me: Does the Qur’an say that Abraham attempted to sacrifice Ishmael? Me: Do you know where it is written that Ishmael is the object of sacrifice? Them: It must be in Surah Ibrahim. Let me find it. Hmmm, it’s not here. Me: Perhaps you can look at Surah as-Saffat. Them: Yes, here’s the story. Here it tells about Ibrahim who went to sacrifice his son. Me: Does it say Ishmael there? Them: Well…his name isn’t here, but it’s him. It must be written somewhere else. Let me look for it. Me: I’m sure you will not find it because it isn’t there. Does it bother you that Ishmael’s name isn’t actually mentioned in a story so important to Islam? Them: Well, I’m sure it’s somewhere else in the Qur’an. It isn’t and I find that very interesting. Especially since one of the main places Muslims say the Bible has been corrupted is here, where Abraham agrees to sacrifice his son. The Bible says that son was Isaac, Islam disputes that. But the Qur’an doesn’t specifically name Ishmael within the story itself. I wonder why? One gentleman that I spoke with asked his imam to call me and answer my question. When I posed the question to the imam, he said that I was correct: Ishmael’s name isn’t found in the Qur’anic version of this story. The understanding that Ishmael was the intended sacrifice is Islamic tradition, which is binding upon Muslims to believe. Therefore, all Muslims believe that even though not specifically named, Ishmael was the son whom Ibrahim prepared for sacrifice. For those wondering: NO, I wouldn’t embrace the Qur’anic version of this story if Ishmael’s name were specifically mentioned. I fully believe the Bible’s version and simply use this “irony” as a conversation starter with Muslims. Arabic: Can You Read That? As my Arabic studies progress, I catch myself trying more and more to pick out identifiable words from inscriptions around the city. While on the Temple Mount, I focused on the script that goes around the octagon building that supports the Dome of the Rock. It is a particularly difficult script (for me), but I was able to identify a few things. “Can you pretty easily read the script going around the Dome,” I asked. “Yes, because I have it memorized. We start memorizing it in first grade” was the answer I received. First, memorizing the script on the Dome gives local Muslims a heart connection to the Dome of the Rock; or more correctly, the whole of the Al Aqsa Mosque compound. And that is particularly true when it is done at an early age. The social and political implications of such a connection are worth consideration as the issue of control of and entrance to the Temple Mount makes its way to the front page of the news cycle. The second thing that struck me about children memorizing that particular script is that I know from talking to others that that script isn’t a stand alone memory verse for Muslims. Many Muslims around the world strive to and succeed at memorizing the Qur’an, which is about the size of the New Testament. I don’t personally know any Christians who have memorized the New Testament. I’ve heard of not more than a handful who have done it, but I don’t know them. I’m familiar with various children’s ministries that “focus” on Bible memorization, but most of them focus on isolated verses. Which is to say, very few Christians memorize large sections of either the Old or New Testaments. Why is that? I do have a few friends who have been an encouragement to me to do much better in Bible memory; they have endeavored to memorize whole chapters, even whole books. May their tribe increase, and may they continue to challenge me in Bible memory. 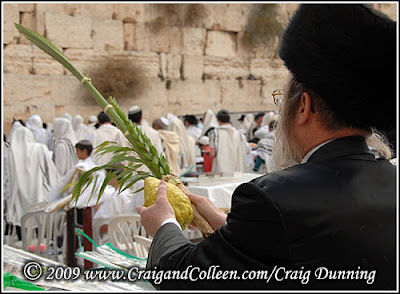 The four items noted above are called the Four Species and can be seen being used (in the photo below) in a celebration/prayer ritual at the Western Wall during the Feast of Tabernacles.